Finally home in February on Valentine’s Day so I can do a Valentine’s Day table, we are usually traveling this time of year. This is a simple table with red and white. I used a few of my vintage Valentine hankies that I collected for a while. 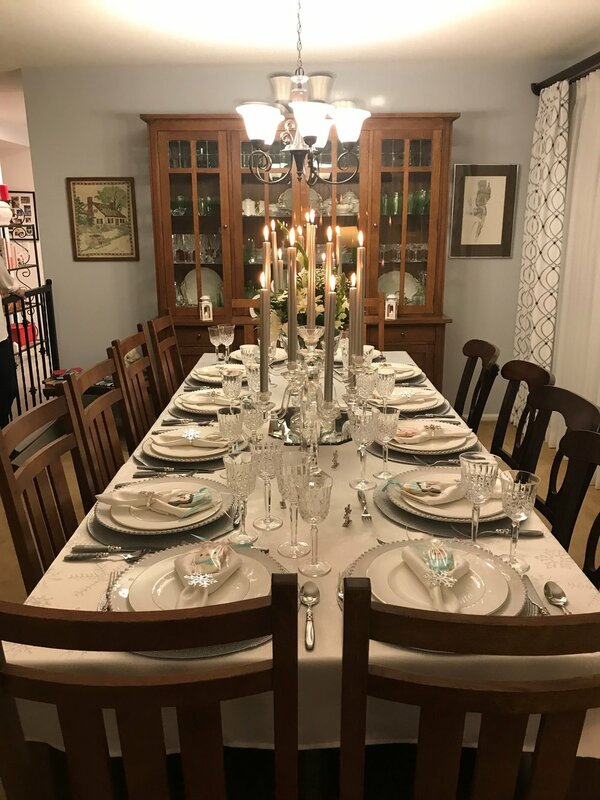 The glasses are Waterford Marquis, I have goblets and iced beverage glasses, these are some of my favorites, used in many tablescapes. Tablescapers always want to know where everything comes from so they can replicate the design themselves. The red heart napkin rings and napkins came from Pier1 this year and I found the heart place card holders on Etsy. I have had the red metal wreath that is hanging on the hutch for many years. I found the felt heart garland on Amazon this year. Found the small red hearts scatter at Sur La Table on sale. Place mats are from Pier1. I found the white chargers at Crate and Barrel a few years ago. They are called Riviera and are made in Portugal by Paola Navone. They are really heavy and the edge design works well with many of my dinner plates. The red heart dinner plate and red heart salad plates are both made by Bordallo Pinheiro in Portugal. The heart salad plate is one of my favorite plates, the design is really unique. The white scalloped plate breaks up the red plates and is called Butterfly Meadow Cloud by Lenox. The red flatware is called Jubilee and it is made by Cambridge. Valentine’s Day is one of my favorite holidays and I love this red and white design! 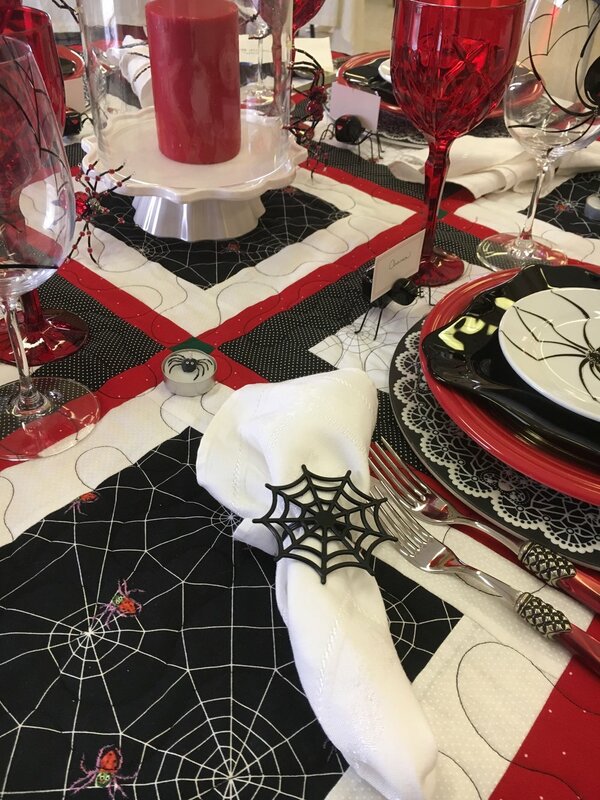 For a change I did a purple, black, and white table this year for Halloween. I picked the theme black witches last year and started gathering what I needed. The table runner was made by someone on Etsy and the colors worked perfectly for what I wanted to do. I also got the napkins on Etsy as well as the witch napkin rings. I saw a witch design I liked and asked if they could make napkin rings, I really love the way they turned out. 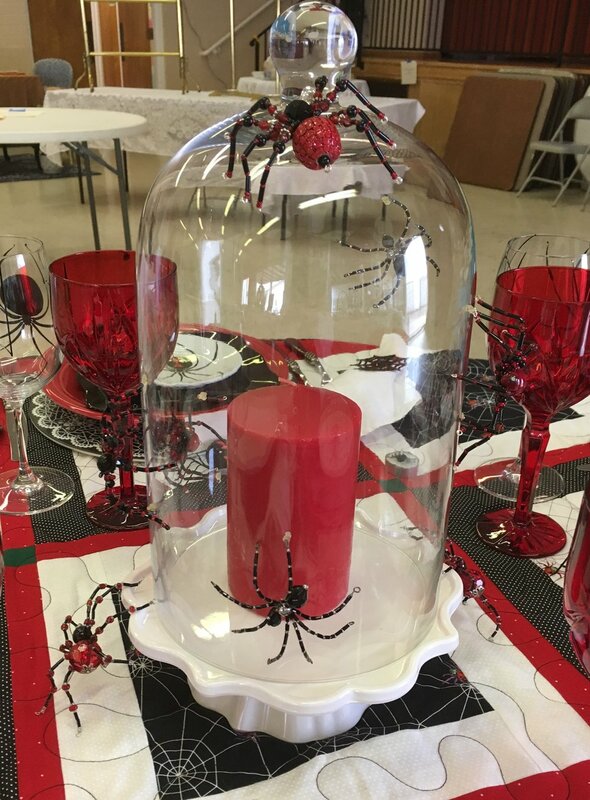 The witch centerpieces came from Pier1. They were a distressed black and I am not a fan of distressed wood so my hubby spray painted them for me, love the way they turned out. 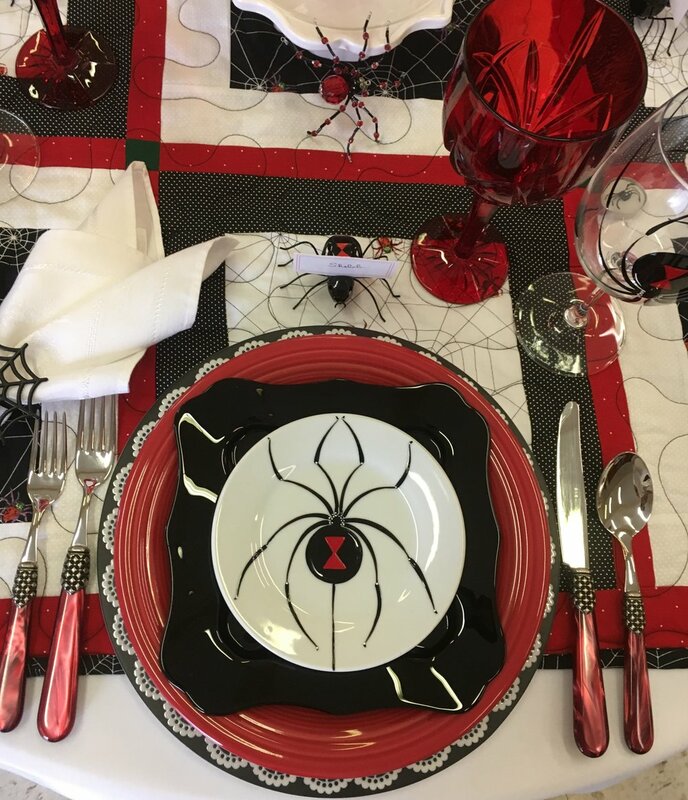 The black studded pumpkin is from Pier1 as well as the place mats. Pier1 has good sales from time to time. The chargers are Bormioli Rocco Inca in purple and I bought them on sale on Amazon. Have a few other colors of this one, it is really heavy glass. The picture looks dark but it is a really pretty purple color. Found the purple goblets at HomeGoods. I was able to get 6 at one store and 6 at another one. The black goblets came from Ebay, they are Premiere by the Libbey Glass Company. The silverware is Zaffiro Flatware, I think I got it on sale at Neiman Marcus. Over the years I bought 6 different colors because I love the way it looks. The dinner plate is Fiesta in purple, it is actually lighter in color than the photo shows. The white plate is more for spring tables but the butterfly design is hidden. It is by Lenox and is called Butterfly Meadow Cloud. I think I found them at HomeGoods. The black plate is by 10 Strawberry Street, I think it came from HomeGoods as well. I looked and looked for months for a plate with a witch on it but I wanted black and white only, no orange. Lots of witch plates but none black and white. I finally found these on Ebay, Crate and Barrel sold them a few years ago. I bought the black house place card holders on Ebay but they have them at Target, Hearth and Hand with Magnolia. It all came together finally, worked on this one for a long time!